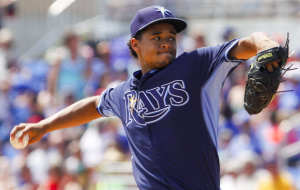 After much speculation, the Tampa Bay Rays have finally pulled the trigger on a trade involving ace Chris Archer. To the surprise of many, the team getting him is the Pittsburgh Pirates. The Rays and Pirates agreed to a deal just before Tuesday’s trade deadline. In exchange for Archer, the Rays receive outfielder Austin Meadows, pitcher Tyler Glasnow, and a player to be named later. A few weeks ago, the Pirates looked more like sellers than buyers. But they have kicked it into gear and climbed within striking distance of a playoff spot. With the acquisition or Archer, it’s safe to say Pittsburgh is all-in for a playoff run in 2018. At the moment, the Pirates are just three games over .500 and seven games behind the Cubs in the NL Central. They also have to jump over the Brewers to get there. However, they are within 3.5 games of a wild-card spot. With Archer now a member of their rotation, they believe they are capable of earning a spot in the postseason. Archer actually hasn’t been at his best this season. He’s in danger of posting his third consecutive season with an ERA over 4. At the moment, Archer is 3-5 with a 4.31 ERA in 17 starts. But he’s been a lot more consistent since a rough April. He could also see an uptick in his productivity upon moving to the National League. Perhaps more importantly, Archer joins a rotation that includes three other pitchers with an ERA under 4 in Jameson Taillon, Trevor Williams, and Joe Musgrove. With Musgrove finally healthy and Ivan Nova also bringing stability to Pittsburgh’s rotation, the Pirates have quietly put together a rather formidable starting-five that could put them in a position to get hot and stay hot down the stretch. Of course, part of the beauty of acquiring Archer is that he’s also a long-term commodity. Including two option years, Archer is under contract through the 2021 season at a price of less than $28 million total. Even if he maintains his current levels of productivity, that’s a bargain for the budget-conscious Pirates, making this an outstanding trade by the Pittsburgh front office. For the Rays, trading Archer capped off a busy trade season that saw them trade most of their established starters, as well as catcher Wilson Ramos. However, they also added outfielder Tommy Pham and a whole slew of prospects. Meadows and Glasnow, the players acquired from Pittsburgh, are arguably the two biggest pieces they acquired. Meadows has long been a prized commodity in Pittsburgh’s farm system. In his first extended big league action this season, he’s hitting .292 with an OPS of .795. He, Pham, Mallex Smith, and Kevin Kiermaier could form a strong outfield in Tampa for years to come. Glasnow, meanwhile, was also a top-rated prospect for many years. He has struggled at the big league level, forcing the Pirates to move him to the bullpen this season. But at age 24, his upside remains high, as his stuff is outstanding. This trade could end up being huge for both teams. The Pirates gave up a lot to get Archer. But he’s in a position to lead their rotation for three and a half years, on top of boosting their playoff hopes for 2018. The Rays won’t complain much either. If Meadows and Glasnow come anywhere close to reaching their full potential, Tampa will have two cornerstone players to help lead them into the future.